On Friday, July 18, Daniel Barash of The Shadow Puppet Workshop will be visiting Pacific West Gymnastics Summer Camp for his “Spin Me a Shadow, Tell Me a Tale” Shadow Puppet Assembly Program. Discover the magical world of shadow puppetry with Daniel Barash of THE SHADOW PUPPET WORKSHOP. After first introducing audience members to the art of shadow puppetry (including numerous puppets from Southeast Asia), Daniel will then perform shadow puppetry versions of best-loved folktales from around the world. The audience will be encouraged to participate throughout the program, and volunteers will be invited up to the shadow screen to help perform the shows. 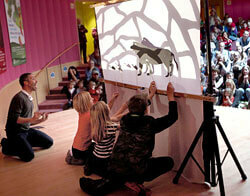 Plus, audience members will receive shadow puppet templates to continue the fun at home! See you in the land of shadows and paws! Daniel Barash, based in Berkeley, CA, has presented hundreds of shadow puppetry assembly programs across the United States. His performances are engaging, participatory, and fun! Daniel is one of 43 Kennedy Center National Workshop Leaders, and travels around the country sharing his love of shadow puppetry with both educators and students. The Shadow Puppet Workshop will be joining us as a Special Summer Camp Guest on Friday, July 18 at 10:45am.